Back in 2014 Tesco launched the Eat Happy Project and since then they have been encouraging children to learn more about food and where it comes from. 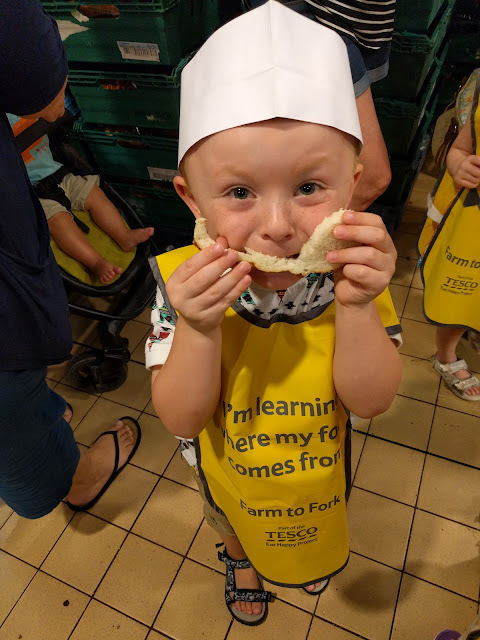 This week Elliot and some of his friends got the chance to go behind the scenes at their local Tesco and go on one of the Farm to Fork trails that lots of Tesco stores are now offering. We started the tour by heading into the bakery and the children were shown how the bread was mixed - they all had a good look in the giant mixers! 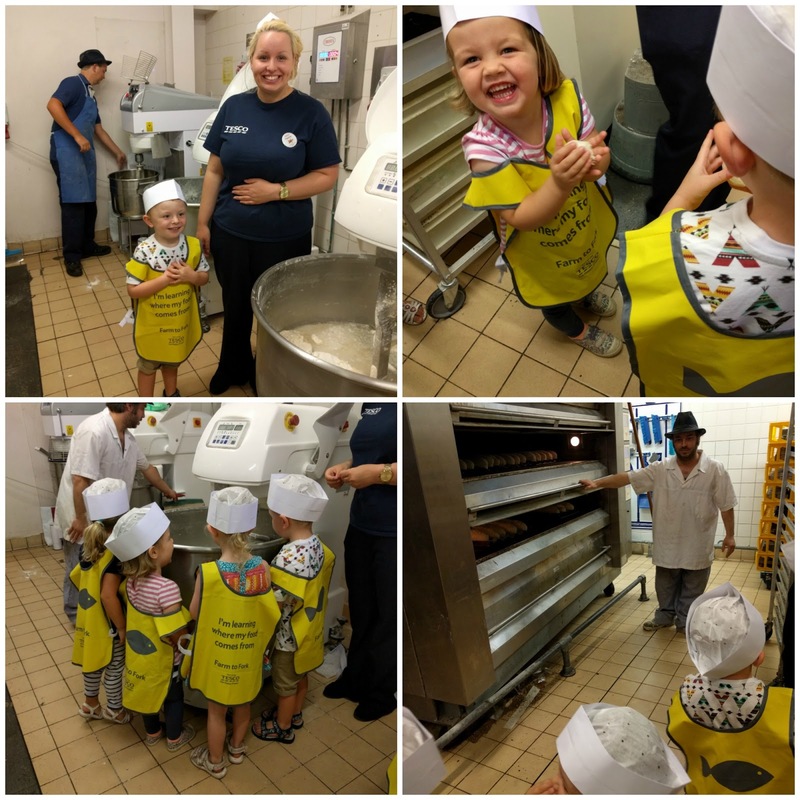 They were able to hold some dough to see what it felt like and they were shown the large ovens where all the bread gets baked. They ended the bakery tour by sampling some bread and some freshly made pancakes - cue big smiles all around! 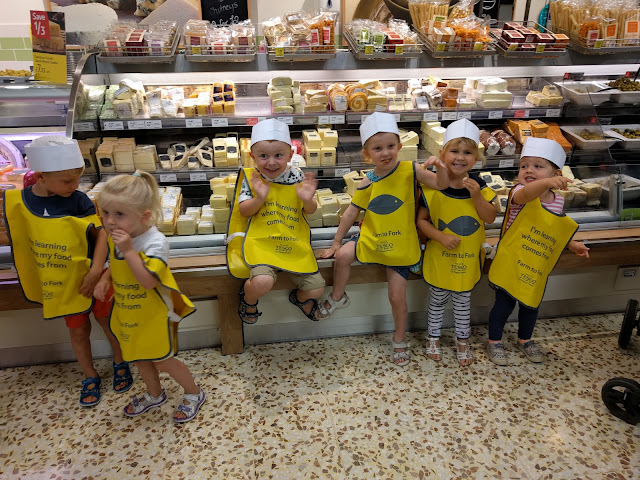 We moved onto the cheese counter and Fearne produced 4 big plates piled high with cubes of cheese - we had a Red Leicester, Cheddar, Applewood Smoked and a cheddar that had spring onion in it. This proved to be a really popular stop on the tour, especially for the mums! I love cheese but the spring onion one was a new one for me and really yummy, I'm going to have to look out for it next time I do my shopping. 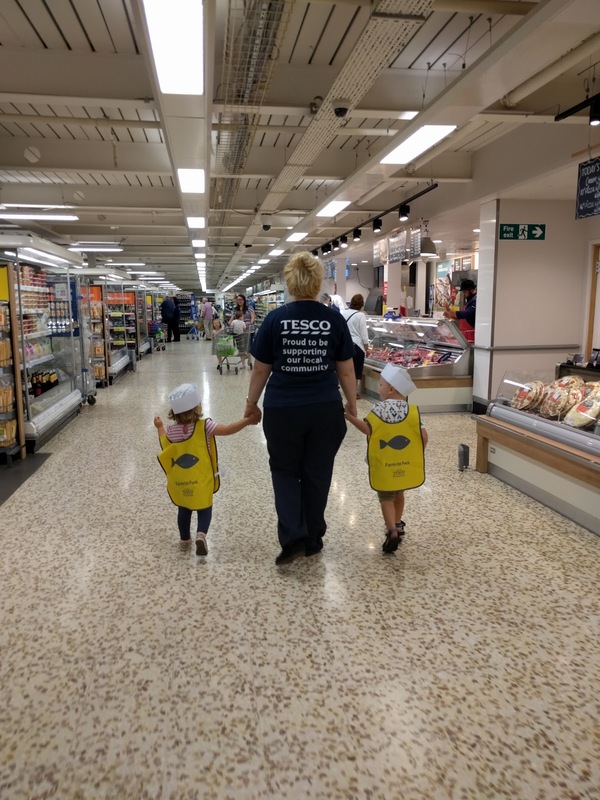 We were then escorted through the staff only doors to have a look round the warehouse and the kids even got to take a peek into the giant fridge and freezers. They were quick to spot the ice lollies in there! 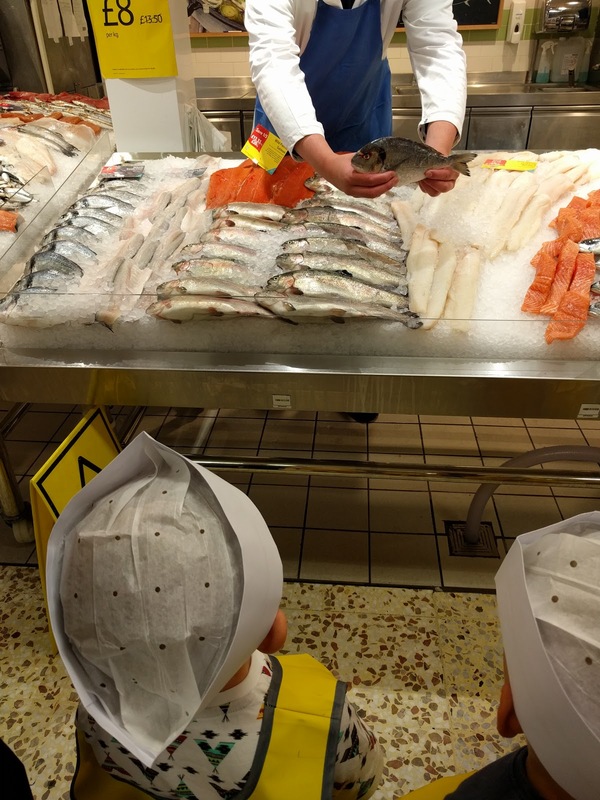 Our last stop of the morning was the fruit and veg aisles where Fearne opened a bag of sugar snap peas ("I'm allowed to do this, I work here!) for the kids to try. This seemed to go down quite well even if some of the children preferred to squish the peas instead! 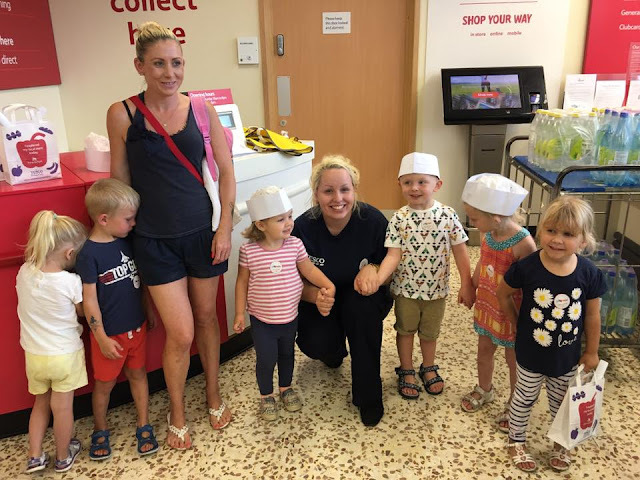 At the end of the tour the children were all given a goody bag which had some information packs, stickers and fruit in and they had their photo taken with Fearne so she could put it on Facebook. The tour lasted an hour and was really enjoyable, all the children loved having a look round and they loved tasting the samples! 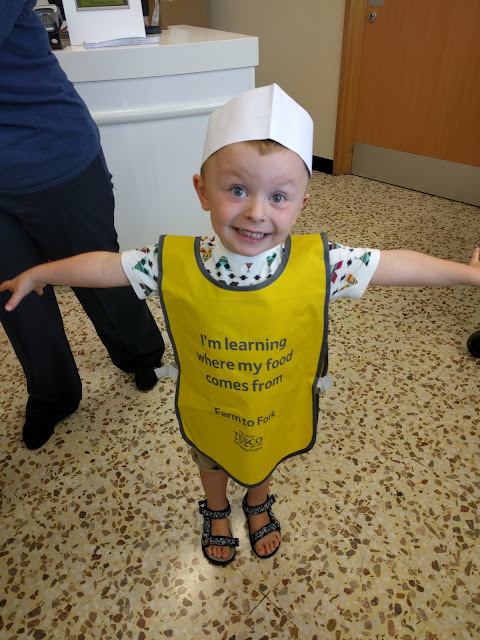 I did wonder how suitable the tour would be for 3 year olds and what would be covered, would they find out that their sausages come from Peppa?! Fearne didn't go into too much detail, it was more a tour of the supermarket but I guess with older children they might cover this too. For the 3 year olds it was a great opportunity to see behind the scenes!